When the America began her Atlantic crossings in 1946 some travel agents questioned the ship’s ability to attract affluent passengers. Cunard lines offered bigger and faster ships in the Queen Mary and Elizabeth. Their service was impeccable. America met the competition and over the years attracted a loyal following. This was accomplished by offering luxurious First Class facilities with service that was superlative yet genuine and friendly. In addition she offered something no other ship had, a piece of America at sea, a more democratic spirit; a fresh new world appeal. As this country’s ship of state she was a showcase for the best in American engineering, art, craftsmanship, interior design and cuisine. The ship was an all American product. From the Oregon pine decking to the Rhode Island silverware on the tables, practically every State in the Union contributed material and equipment. The interiors were fashioned by American designers, architects and decorators. The food featured the best regional cuisine. It all came together to create a truly First Class experience that would attract tourist, diplomats, royalty and Hollywood stars. First Class fare to Southampton in 1951 was $295.00 and up in First Class, $200.00 in Cabin and $160 in Tourist. For that price passengers sailed on a floating luxury resort offering the refinement and conveniences of the finest American hotel. They enjoyed expansive deck space and elegant public rooms. First Class had the best location, amid ship, away from the vibration of churning propellers and the impact of waves slamming into the bow. It was a wonderful way to travel, civilized, luxurious, entertaining, relaxing, and friendly without being stuffy. The America set the standard for American First Class travel at sea. When the America began her Atlantic crossings in 1946 some travel agents questioned the ship’s ability to attract affluent passengers. Cunard lines offered bigger and faster ships in the Queen Mary and Elizabeth. Their service was impeccable. America met the competition and over the years attracted a loyal following. This was accomplished by offering luxurious First Class facilities with service that was superlative yet genuine and friendly. In addition she offered something no other ship had, a piece of America at sea, a more democratic spirit; a fresh new world appeal. As this country’s ship of state she was a showcase for the best in American engineering, art, craftsmanship, interior design and cuisine. The ship was an all American product. From the Oregon pine decking to the Rhode Island silverware on the tables. Practically every State in the Union contributed material and equipment. 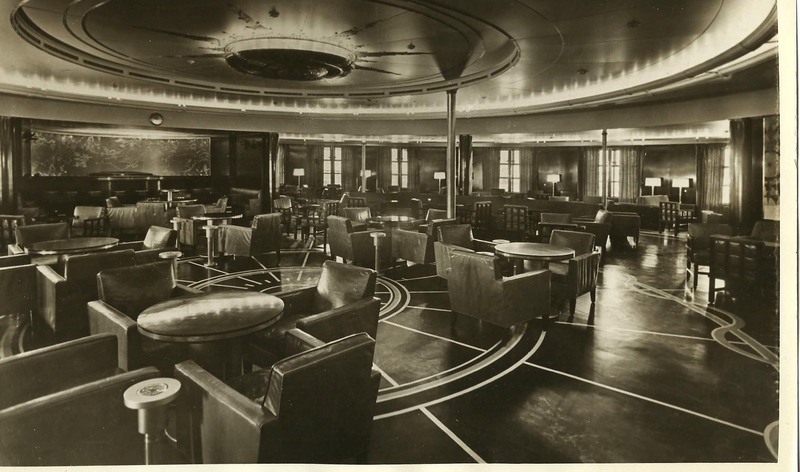 The interiors were fashioned by American designers, architects and decorators. The food featured the best regional cuisine. It all came together to create a truly First Class experience that would attract tourist, diplomats, royalty and Hollywood stars. First Class fare to Southampton in 1951was $295.00 and up in First Class, $200.00 in Cabin and $160 in Tourist. For that price passengers sailed on a floating luxury resort offering the refinement and conveniences of the finest American hotel. They enjoyed expansive deck space and elegant public rooms. First Class had the best location, amid ship, away form the vibration of churning propellers and the impact of waves slamming into the bow. It was a wonderful way to travel, civilized, luxurious, entertaining, relaxing, friendly without being stuffy. The America set the standard for American First Class travel at sea. A favorite evening activity, racing took place in the Main Lounge. John Lock, the purser on this August 1949 picture was in charge. Described as systematic about the business of having fun, he would exhort the usually staid crowd with statements such as. “I recommend giving the horses funny names such …such as Chilly, by Cold Wind out of Atlantic; Pop, by Cork and Bottle; Mal de Mer, by Trouble out of Rough Seas; Highball, by Scotch out of Bottle. Dining is a Pleasure ! ——————————————————————————————————————- Those who venerated a good drink would come together around the bar in what was simply called the “Cocktail Lounge”. This H shaped room was a dark and elegant watering hole. A favorite meeting place before lunch and dinner and equally popular for the after dinner brandy. Dark ebonized paneling was offset by bright green leather banquettes and bar stools. Cream colored drapes kept out any offending natural light. Carved Lucite columns shed a low indirect glow on imbibing patrons. The illuminated ceiling was covered by three amusing paintings depicted shipboard life by Constantine Alajalov When I traveled on the ship in 1950 I was too young to appreciate this room. Today I imagine sitting on the soft green leather banquettes, a dry martini in hand, enjoying a good conversation and the gentle sway of the ship. And, for mental diversion, looking up and smiling at the shipboard foibles the 300 characters on the glowing ceiling.